Subbed pine nuts for almonds and reduced the vanilla a bit. Not too sweet. Nice. I don't think the currants called for in this recipe are meant to be red currants. Nice substantial muffin. The finely-diced pear pieces make a moist center, but not one that tastes like under-done muffin. I used bosc pears. Barletts might have made the muffin even more moist...not desireable. Easy and delicious muffins. They are very moist from the ricotta. Maple-walnut variation of this recipe is very good. I added raisins. This is a soft, pillowy dough that makes lovely cinnamon rolls, but is also nice as plain rolls with no filling. This are satisfying without being overly rich. I added orange extract to the butter in the filling; orange zest would be even better. Needs at least 1.5 Tbs butter in filling (rather than 1 Tbs, as listed), and cinnamon-sugar could also be increased a bit. Blackberries and lime are suggested accompaniments, not essential ingredients. I like this with almond extract instead of vanilla and a little bit of cornmeal subbed in for some of the flour for texture. Used coconut milk instead of dairy once, and that was successful. Creme fraiche and vanilla yogurt are suggested accompaniments, not essential ingredients. Over 350 easy Recipes for Irresistible Muffins, Glorious Omelets, Tasty Pancakes, Homemade Protein Bars, and Other Delights to Launch and Sustain Your Every Day. The beloved author and illustrator of the Moosewood Cookbook shows you how to prepare more than 350 delicious and healthy breakfast foods -- any time of day. Breakfast is back! And Mollie Katzen's Sunlight Café offers tasty, protein-rich, meatless breakfasts to boost your energy level and get you going first thing in the morning -- or any time of the day. Mollie Katzen provides simple, mouth-watering, healthful recipes and menus for every day of the week, whether you are preparing a sit-down brunch for ten, breakfast-on-the-go for kids running late, a light bite after a late night, or a luxurious breakfast in bed. 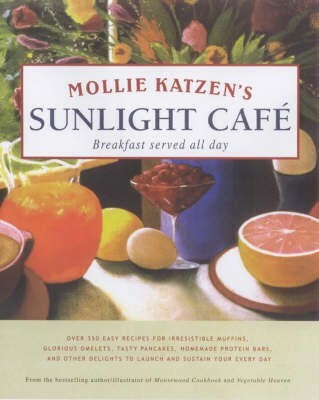 Lavishly illustrated throughout with Mollie's luminous paintings, Mollie Katzen's Sunlight Café is divided into 12 chapters of breakfast fare, including yogurt and cheese, griddled foods, muffins and biscuits, eggs and tofu, whole grain cereals, homemade breakfast bars and coffee cakes, puddings and custards -- and much more. In addition to showing you exactly how to make the perfect omelet or the crispiest waffles, Mollie offers irresistible recipes that range from the familiar Winter Fritata with Red Onions, Red Potatoes, and Goat Cheese, to the favorite Gingerbread Pancakes, to the surprising Basmati Almond Muffins, and on to irresistible Crispy Southwest Polenta Hash. And Mollie's energy-packed Peanut Butter Chocolate Chip Oatmeal Protein Bars are certain to become a ray of sunshine in any kitchen. Mollie Katzen, with nearly five million books in print, is one of the best selling cookbook authors of all time. Best known for her groundbreaking books Moosewood Cookbook and The Enchanted Broccoli Forest, she is also the author/ illustrator of Vegetable Heaven and a series of award-winning cookbooks for children. Recently named by Health magazine one of the Five Women Who Changed the Way We Eat, Katzen is a charter member of the Harvard School of Public Health Nutrition Roundtable. A working artist as well as a prolific author, she lives near Berkeley, California.